The significant technological improvement of endoscopic instrumentation has allowed, in the last 10 years, a widespread diffusion of neuroendoscopic procedures. Nevertheless, severe, sometimes life-threatening, complications may occur during neuroendoscopic surgery, and the incidence and age specificity of complications in children have been underdescribed so far. 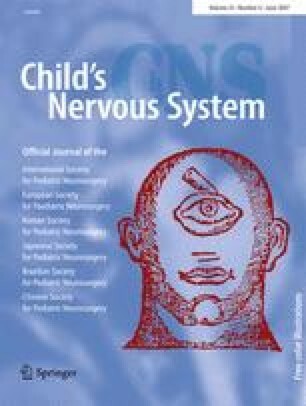 Complications recorded in a prospectively collected database of pediatric patients undergoing neuroendoscopic procedures were analysed; the medical histories of the patients and the surgical procedures were reviewed. Complications occurred in 32 out of 231 (13.8%) procedures performed for the management of obstructive hydrocephalus (137), multiloculated hydrocephalus (53), arachnoid cysts (29) and intraventricular tumors (12). Subdural hygroma occurred in 11 cases, seven requiring subdural shunting. In one of these cases, infection of the subdural space occurred and required a craniotomy. Cerebrospinal fluid (CSF) infection occurred in 11 cases. In one case, a frontal abscess developed and was managed with craniotomy. CSF leak occurred in nine cases, intraventricular haemorrhages in two, technical failures in seven, subcutaneous CSF collection (managed with lumbo-peritoneal shunt) in one, thalamic contusion and post-operative transient akinetic mutism in one. This patient suddenly died 6 months later, probably as a consequence of closure of the stoma. Two patients developed secondary compartmentalisation of the ventricles after complicated endoscopic third ventriculostomy. In nine cases, these complications were associated. Overall, no patient died after the procedure (operative mortality 0), one patient died 6 months after the procedure for unexplained events (sudden death rate 0.4%), and three patients presented permanent disability as a consequence of surgical complication (permanent morbidity 1.3%). Complication rate of neuro-endoscopic procedures is not negligible even in experienced hands. The majority are minor complications which do not affect the final outcome, but sporadically major events may occur, leading to significant problems in surgical management and, occasionally, to permanent disabilities. Careful selection of patients on pre-operative imaging studies and intensive training of surgeons are mandatory to improve results. Presented at the Third World Conference of the International Study Group on Neuroendoscopy (ISGNE), Marburg, Germany, 15–18 June 2005.